It's under the offer terms here. You not reading = fraud? Come on. YES Indeed... FRAUD! Those were not the offer terms last year. 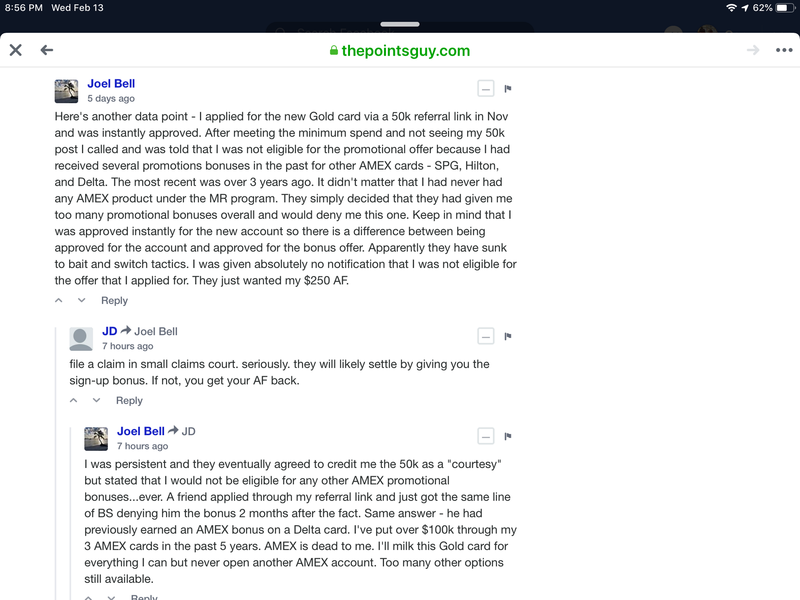 I was solicited for Amex gold welcome offer and they later retracted. Trust me, they have a whole team of people that monitor if you have too many accounts and offers. Kind of like Chase “5/24” rule but Amex retracts even after approving the account. Exactly what happened to me. Terrible fraud! I applied this morning was approved with 70K Limit. Will post how long it takes for the 100K to post once the required spend it done. I was prescreened for the offer and wasn’t going to apply until later in the year but you can’t go wrong with all the perks that they are offering. wow a 70k limit do your other credit cards normally get this high of a limit? Nicely done! i wouldnt pay $450 for this card. Doesn’t compare to the Amex plat benefits but at $150 it a viable card in my wallet and has some decent benefits. Yes that is indeed the case. If you google "Marriott cross issuer rules" you can find a number of articles that will explain the specifics, and if you do an upgrade or new application make sure to check the offer terms because there will be a list of various exclusions relating to holding, having held, or getting bonuses on other Marriott cards across both issuers. Ah, very interesting, thank you. I have not been following the credit card scene much lately, so I missed this. Appreciate it. I have had a DL AMEX for years so that promotion is well in the past, but even that could nullify this Bonvoy promo?